motowife - CA Love this hoody!!! "Purchased this awhile back, it is my favorite zip up hoody! 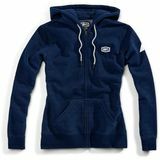 Great quality and still feminine looking, definitely recommend to other ladies out there with a need for a zip up hoody that does not "smash the girls"!!!!" Demon656 Great fit with quality material "Fit perfectly on her and hasn't shrunk"